Brate brought in one of two targets for 13 yards in the Buccaneers' 37-34 loss to the Bengals on Sunday. 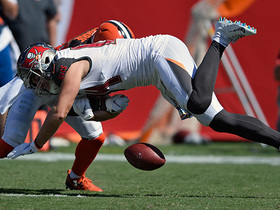 Brate brought in three of four targets for 23 yards in the Buccaneers' 26-23 OT win over the Browns on Sunday. He also lost a fumble. Brate brought in his only target for a 15-yard touchdown in the Buccaneers' 34-29 loss to the Falcons on Sunday. Brate will likely resume No. 2 tight end duties Sunday in Atlanta with O.J. Howard (knee) expected to return from a one-game absence, Adam Schefter of ESPN reports. Brate is expected to serve as the Buccaneers' lead tight end for at least the Week 6 game against the Falcons while O.J. Howard (knee) is sidelined, Marc Sessler of NFL.com reports. 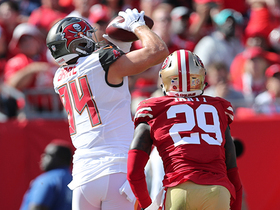 Brate brought in three of four targets for 29 yards and a touchdown in the Buccaneers' 48-10 loss to the Bears on Sunday. Analysis: Brate has now scored in consecutive games after only being targeted twice and going catchless over the first pair of contests. The fifth-year tight end could see a significant bump in snaps if the knee injury suffered by O.J. 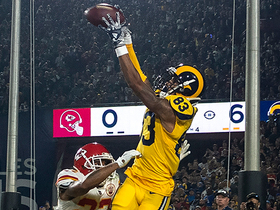 Howard on Sunday causes him to miss any time, but otherwise his fantasy value as compared to the past two seasons appears to have taken a hit due to the latter's emergence in the early portion of the campaign. Brate brought in three of four targets for 34 yards and a touchdown in the Buccaneers' 30-27 loss to the Steelers on Monday night. Brate was not targeted in Sunday's 27-21 win over the Eagles. 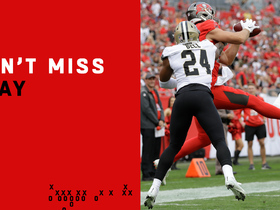 Brate failed to come up with either of his two targets in the Buccaneers' 48-40 win over the Saints on Sunday. Brate didn't draw any targets in Friday's preseason game against the Lions. Analysis: After catching seven of eight targets for 76 yards through two preseason games, Brate was held off the stat sheet while logging just 13 snaps Friday night. Meanwhile, O.J. Howard got the start and caught both of his targets for 22 yards while playing 27 snaps on offense. The workload split between the two tight ends will need to be monitored into the regular season, starting with a Week 1 road game against the Saints. Brate brought in all five of his targets for 48 yards in the Buccaneers' 26-24 preseason win over the Dolphins on Thursday. Brate is slated to catch passes from backup quarterback Ryan Fitzpatrick for the first three games of the 2018 regular season in the wake of Jameis Winston's expected suspension for violating the NFL's personal conduct policy, Jenna Laine of ESPN.com reports. The Buccaneers and Brate agreed to a six-year, $41 million contract Monday, Jenna Laine of ESPN.com reports. 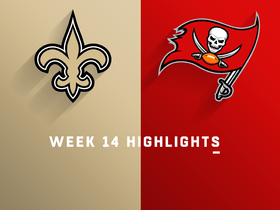 Brate brought in three of five targets for 37 yards in Sunday's 31-24 win over the Saints. Brate (hip, knee) is officially active for Sunday's Week 17 tilt against the Saints, Scott Smith of the team's official site reports. Analysis: Brate's status was fully expected after he wrapped up the week with full practice participation. The third-year pro will look to close out what has been an inconsistent season on a high note, and he should have an opportunity for a solid amount of targets with DeSean Jackson (ankle) inactive and fellow tight end O.J. Howard on injured reserve with an ankle injury of his own. Brate (hip/knee) was a full practice participant Friday but nonetheless is listed as questionable for Sunday's game against the Saints, Jenna Laine of ESPN.com reports. Analysis: After sitting out Wednesday and practicing on a limited basis Thursday, the tight end closed out his week with a full session. He should be fine for Sunday's game, looking to rebound from a 13-yard outing last week against the Panthers in the first game since O.J. Howard (ankle) was ruled out for the year. Brate should be a bit more involved this time around, but he'll facing a New Orlean defense that's given up an NFL-low 529 receiving yards to tight ends. Brate (hip/knee) was a limited practice participant Thursday, Greg Auman of the Tampa Bay Times reports. Analysis: Following Wednesday's DNP, Brate took a baby step toward active status in the season finale with an appearance Thursday. If he gains clearance before Sunday's 4:25 p.m. ET kickoff, he should serve as the Buccaneers' No. 1 tight end with O.J. Howard (ankle) on injured reserve. However, Antony Auclair and Alan Cross are waiting in the wings in the event Brate sits out as well. Brate (hip/knee) was held out of practice Wednesday. Analysis: Brate appeared on the Week 16 injury report with the dual injuries, but ultimately gained clearance to play in Sunday's 22-19 loss to the Panthers. Despite his main competition at tight end, O.J. Howard (ankle), having moved to injured reserve ahead of the contest, Brate didn't really see his involvement pick up, as he finished the game with three catches for 13 yards. Brate may have a similarly understated role if he's able to suit up in the Buccaneers' season finale against the Saints. Brate (hip, knee) brought in three of four targets for 13 yards in Sunday's 22-19 loss to the Panthers. Analysis: Brate figured to be in for an expanded role with the passing game down both DeSean Jackson (ankle) and O.J. Howard (IR-ankle), but he turned in his sixth sub-20-yard effort in the last eight games. The Harvard product has endured a rough second half of the season, posting only 14 receptions for 149 yards and two touchdowns over the last eight contests. He'll look to finish 2017 off on a positive note against the Saints in Week 17. Brate (hip, knee) is active for Sunday's Week 16 tilt against the Panthers, Scott Smith of the team's official site reports. Analysis: Brate was expected to enjoy active status all along, and he'll find himself in a favorable position for plenty of work Sunday. With DeSean Jackson and O.J. Howard both sidelined with ankle injuries -- the latter now on injured reserve -- Brate should slot in alongside starting receivers Mike Evans and Chris Godwin as one of Jameis Winston's primary targets, affording him the opportunity to return to some of his solid early-season production. Brate (hip/knee) is expected to play Sunday against Carolina, Adam Schefter of ESPN reports. Analysis: Brate was limited at Friday's practice and is listed as questionable on the official injury report. If he ends up playing, Brate will face a Carolina defense that's allowed the second fewest receptions (48) to tight ends this season, but he could get more targets with tight end O.J. Howard (ankle) placed on injured reserve. Fantasy owners will want to double check Brate's status before the 1 pm ET kickoff. Brate (hip/knee) remained limited at Friday's practice and is listed as questionable for Sunday's game in Carolina, Jenna Laine of ESPN.com repots. Brate was listed as limited on Wednesday's injury report due to hip and knee injuries, Greg Auman of the Tampa Bay Times reports. Brate is expected to serve as the Buccaneers' primary tight end over the team's final two games following O.J. 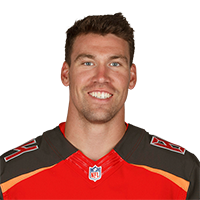 Howard's (ankle) placement on injured reserve Wednesday, Scott Smith of the Buccaneers' official site reports. Brate brought in four of five targets for 49 yards in Monday night's 24-21 loss to the Falcons. Brate injured his knee and is questionable to return to Monday's game against the Falcons, Greg Auman of the Tampa Bay Times reports. Analysis: Brate was the victim on a play the Falcons were flagged for hitting a defenseless receiver. 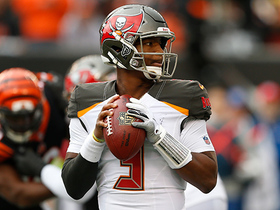 The Buccaneers still have O.J. Howard available, but Antony Auclair or Alan Cross could also get involved if Brate doesn't return. Brate (hip) was a full practice participant Friday, Greg Auman of the Tampa Bay Times reports. Analysis: Following a limited practice to start the week, Brate seemingly has answered any questions regarding his availability for Monday's game against the Falcons. His workload is the real issue, as he hasn't caught more than two passes in a game since October. Brate was limited at Thursday's practice due to a hip issue, Greg Auman of the Tampa Bay Times reports. Brate brought in his only target for 11 yards in Sunday's 24-21 loss to the Lions. Brate (hip) brought in two of six targets for 39 yards and two touchdowns in Sunday's 26-20 overtime loss to the Packers. Analysis: Brate awoke from a multi-week slumber in notable fashion, bringing in both of Jameis Winston's (shoulder) touchdown passes on the afternoon. The fourth-year tight end's trips to the end zone were his first since Week 6, and his 39 receiving yards, while modest, represented his best effort in that category since Week 8. Brate will look to continue his resurgence against the Lions in a Week 14 home tilt. Brate (hip) is active for Sunday's Week 13 tilt against the Packers. 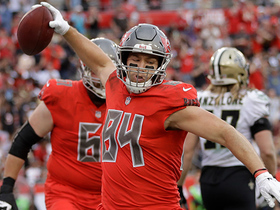 Analysis: The fourth-year tight end will hope to boost his numbers back up with the return of Jameis Winston (shoulder) after notching just one reception apiece in the last three games with Ryan Fitzpatrick under center. However, while the quarterback change might help, rookie O.J. Howard's emergence may also continue eating into Brate's opportunities moving forward. Brate (hip), who is listed as questionable for Sunday's game against the Packers, is expected to play, Adam Schefter of ESPN reports. Brate (hip) is listed as questionable for Sunday's game in Green Bay, Tom Silverstein of the Milwaukee Journal Sentinel reports. Brate popped up on the Buccaneers' injury report Thursday due to a hip issue. He was listed as a limited participation in the team's practice session, Tom Silverstein of the Milwaukee Journal Sentinel reports. Brate brought in one of two targets for six yards in Sunday's 34-20 loss to the Falcons. Brate (ankle) was a full practice participant Friday and doesn't have a designation on the final injury report for Sunday's game in Atlanta. Analysis: Brate was limited at practice the previous two days, but there was never any report to suggest he was in danger of missing a game. His waning involvement in the Tampa passing attack sans Jameis Winston (shoulder) is the real concern, with Brate looking to end a streak of three straight games with exactly one catch for 12 yards or less. Brate (ankle) was a limited practice participant Wednesday, Greg Auman of the Tampa Bay Times reports. Analysis: Brate apparently picked up an injury in Sunday's 30-20 win over the Dolphins, but his recent lack of production is a larger concern than the ankle. After notching five straight games with at least 60 yards in Weeks 4-8, Brate has been held to exactly one catch for 12 yards or less in three consecutive outings. While some form of rebound is likely, Brate may be stuck in a complementary role, playing without Jameis Winston (shoulder) while sharing targets and snaps with O.J. Howard. Brate brought in one of three targets for 12 yards in Sunday's 30-20 win over the Dolphins. Brate brought in just one of three targets for 10 yards in Sunday's 15-10 win over the Jets. Analysis: Brate had brought in five targets from Ryan Fitzpatrick in previous games this season, but he was somewhat of the forgotten man Sunday. The talented tight end has actually endured a lackluster last two games, posting just two catches (on seven targets) for 19 yards during that stretch. However, Brate's past body of work and talent certainly give him ample opportunity to bounce back, which he'll try to accomplish in a Week 11 road tilt against the Dolphins. 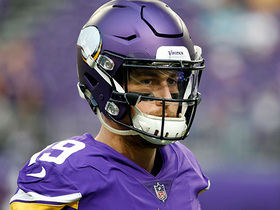 Brate could see an increased target share against the Jets in Week 10 with receiver Mike Evans (suspension) out, Jenna Laine of ESPN.com reports. 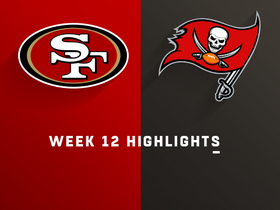 Brate brought in one of four targets for nine yards in Sunday's 30-10 loss to the Saints.